L2 Spanish Pragmatics is a comprehensive, state-of-the-art overview of current research into pragmatics and Spanish language teaching. It presents the research on the teaching of pragmatics and Spanish language as a multifaceted discipline. Written by an international cohort of scholars, the breadth of topics includes innovative topics in the teaching of Spanish, such as genre analysis, discourse markers, politeness and impoliteness, nonverbal communication, irony, and humor, as well as web-based pragmatics resources. A bilingual glossary of terms in pragmatics that will help teachers in their implementation of activities to teach L2 Spanish pragmatics. L2 Spanish Pragmatics constitutes a reference book on current research on learning and teaching Spanish pragmatics. It will be of interest to university lecturers, researchers, and graduate students. It will also be an excellent resource for language educators and K-16 teachers willing to expand their knowledge and apply the teaching of pragmatics as an integral component in the teaching of the Spanish language. "This pioneering volume does a superb job of bringing together a set of research and practical works on different areas of pragmatics and on how to apply the research to the L2 Spanish classroom. The studies give an up-to-date view of a variety of topics, including non-verbal communication, conversational implicatures, discourse management, sociolinguistic aspects of language use, interethnic communication, humor, politeness. There are highly useful chapters on the writing of curricula for the teaching of pragmatics, and specific guidelines on how to promote the development of pragmatic competence. The wide range of issues discussed by experienced scholars points to the vibrancy and innovative potential of the field of L2 Spanish pragmatics, properly underscored in this excellent anthology. It is a significant contribution to the teaching and assessing of L2 Spanish pragmatics, an essential book for every L2 Spanish teacher, important to professors of linguistics, second language acquisition (SLA), pragmatics, and applied linguistics." 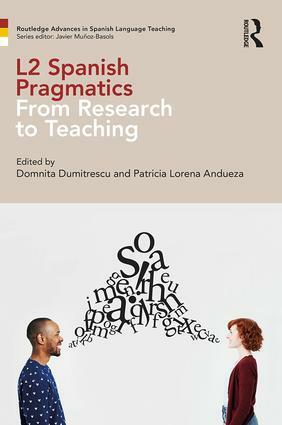 "L2 Spanish Pragmatics: From Research to Practice, superbly edited by Professors Domnita Dumitrescu and Patricia Lorena Andueza, contains twelve groundbreaking studies on the application of pragmatic theory to the teaching of Spanish and its implementation in the Spanish curriculum. All of the authors enjoy well-deserved international reputations in research on pragmatics. This revolutionary volume will have a profound impact on the teaching of Spanish by showing how to incorporate and embed pragmatics into L2 textbooks and class activities in a systematic and meaningful fashion. Moreover, it will provide students with the tools to employ the language in appropriate situational interactions with native speakers of Spanish and to avoid the common language blunders. It is now time to move to the next level of linguistic proficiency through the inclusion of pragmatics in the core curriculum. This volume provides a much-needed roadmap on how to introduce pragmatic competence into syllabus." "This splendid collection of studies is an immensely valuable contribution to applied pragmatics, specifically to second and foreign language pragmatics. The volume edited by Domnita Dumitrescu and Patricia Lorena Andueza fills the gap between theoretical and applied pragmatics, a gap that has been too large for too long in specialized literature. It is true that no one can be a specialist in the whole of pragmatics, but it is equally true that it is not possible to apply pragmatics without knowing its fundamentals. Teachers of second and foreign languages will enjoy the benefits of these inspiring and illuminating pages." Domnita Dumitrescu is Professor Emerita of Spanish at California State University, Los Angeles, and a full member of the North American Academy of the Spanish Language (ANLE), USA. Patricia Lorena Andueza is Associate Professor of Spanish at the University of Evansville, Indiana, USA.